The words “Relax, Reflect, Revitalize and Renew” flash on the homepage of Aqua Massage International’s (AMI) website. 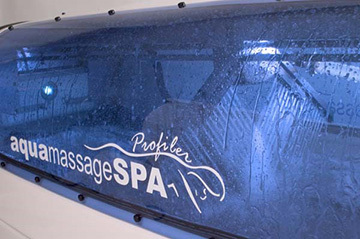 Based in Groton, CT, AMI is one of the world’s largest manufacturers of hydrotherapy “dry water” massage machines. You may not recognize the AMI brand but you are most certainly familiar with its flagship product—the Aqua Massage Machine. Typically found in the center alleys of shopping malls, these capsule-like machines are often situated next to various vendor kiosks. If you have not seen one, they are similar in appearance to an MRI machine, and have been described by some as a cross between a tanning bed and a car wash. When the company was first founded, in 1990, its machines were intended for fitness and sports centers, spas, and clinical and chiropractic settings. Over the last decade, AMI has expanded its product offering to capture a rapidly growing consumer market. As healthcare costs continue to rise, millions of people are actively seeking products and services to enhance their overall well-being. Increasingly, consumers are turning to alternative therapies like massage to release tension, soothe aching muscles and relieve pain. Consumers have already poured more than $3.5 billion into massage services and products and some experts estimate that demand for these products and services will top $1 trillion by 2010. While traditional massage is popular among consumers of all ages, and attracts a particularly upscale, affluent clientele, dry water massage therapy is attractive to a broad consumer market, including people that would not otherwise consider a traditional massage. As opposed to traditional massage therapy which can take up to one hour, aqua massage therapy yields results in only 10 to 15 minutes. Additionally, aqua massage clients are able to stay fully clothed during the massage, no physical contact is necessary to complete the session, and an adjustable touch-pad control provides the client with the ability to adjust massage strength and location. With customer demand at an all time high, AMI sought to optimize the quality of its machine’s design. Specifically, the company needed a linear motion solution capable of guiding and translating the machine’s spray water jet assembly, which moves back and forth along a linear shaft. The machine’s 36 water jets travel along the shaft, massaging either the full length of the body or a concentrated area depending upon customer preference. Unlike most other applications, the Aqua Massage machine presented an unusual design challenge. Not only did the linear motion assembly have to be accurate and durable enough to meet demanding speed requirements, it also had to meet the performance specifications while operating at an elevated temperature and over a distance of 7 feet. “Speed is a crucial factor since the pulsating water jets must be able to quickly adjust from 2 to 10 cycles per second without interruption,” said Gerardo Aristi, Vice President of Operations at AMI. “We needed a linear solution with minimum radial play, vibration and backlash between the screw and nut to ensure a tight fit, and thus a smooth experience for the customer,” said Aristi. AMI turned to Kerk Motion Products, one of the world’s largest exclusive manufacturers of non-ball lead screws and a vendor with whom AMI had a previous relationship. The challenge presented to Kerk was to produce a lead screw and nut assembly that could satisfy all these requirements. After a thorough application analysis, drawing upon years of experience, Kerk recommended a unique nut material capable of meeting all of AMI’s requirements. “The thermal expansion coefficient of the nut material had to be roughly equivalent to that of stainless steel to prevent a binding condition while the machine was in operation. In addition, the nut material could not be hygroscopic, meaning a characteristic whereby something tends to absorb water.” Kerk quickly came up with a custom solution that relied on a specialized nut, combined with one of the company’s proprietary non-ball lead screws, which are manufactured from 303 stainless steel and produced with Kerk’s exclusive precision rolling process. AMI was particularly impressed by the cost effectiveness of the solution, and the high level of engineering expertise provided by Kerk, compared to other vendors. “Kerk is able to approach an application from the ground level and provide the highest quality and most cost-effective solution based on its requirements,” said Aristi. AMI was also pleased with Kerk’s customer service, which has allowed the company to increase its production and meet growing demands. One could say that Kerk’s custom lead screw solution has “revitalized and renewed” AMI’s entire product line.